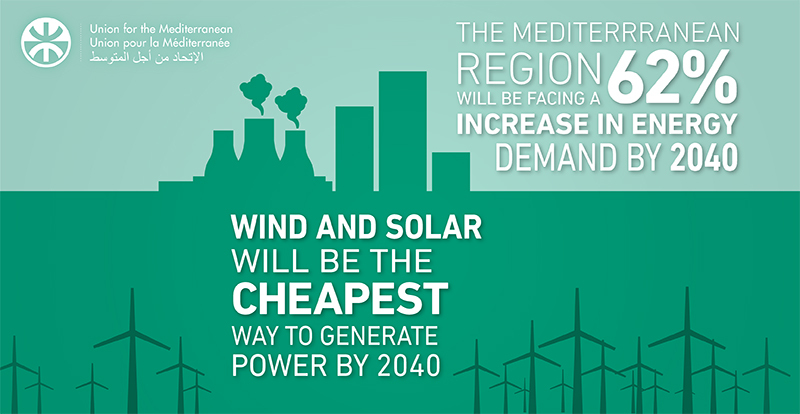 The Mediterranean region is home to an increasing population with growing energy demands. The UfM hosted in Barcelona this past 29 and 30 January the Annual Meeting of the UfM Energy Platforms, the only existing dialogue forum gathering Euro-Mediterranean countries and stakeholders dealing with electricity markets, renewable energy, energy efficiency and gas. To date, the UfM has also labelled and supported projects aiming to mobilise €1 billion to promote renewable energy in 6 countries, including the Tafila Wind Farm in Jordan and SPREF (SEMed Private Renewable Energy Framework), promoted by the EBRD. This June, the UfM will organize in Lisbon the 2nd UfM Energy and Climate Business Forum. 11-12 February 3rd meeting of the Directors-General of Civil Protection of the member states of the UfM, Barcelona. 12-14 February Mediterranean Nouvelle Chance project’s Steering Committee, Matosinhos. 13-14 February 15th Plenary Session of the Parliamentary Assembly of the UfM (PA-UfM), Strasbourg. 28 February 2nd UfM Working Group on Sustainable and Affordable Housing, Paris. 8 March International Women’s Day, French Institute, Barcelona. 12-13 March UfM Technical Working Groups under the Trade pillar: 1st meeting of the Intellectual Property Rights experts on Fight against piracy and counterfeiting, Brussels. 18 March Informal Business Integration Meeting, Barcelona. 1-5 April Launch of Forestry and Land Restoration project within the 6th Med Forest Week, Beirut. 2-4 April UfM Working Groups on Transport and Logistics Connectivity, Barcelona. 9 April Task Force Meeting on Environment, Brussels. 9-11 April UfM Climate Week 2019, Barcelona. 10 April 2nd joint event of Co-Evolve and Med Coasts for Blue Growth, Montpellier.